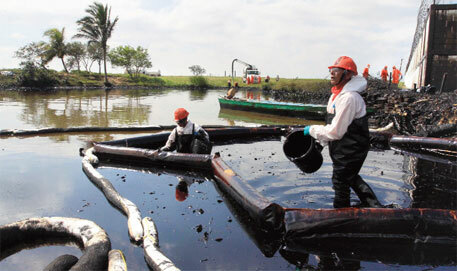 CLEANING waters of oil and hydrocarbons is a difficult task. Currently, commercial emulsifiers are used for the purpose. But they are costly and also do not clean the water completely. Instead they form clumps. Now Indian researchers have shown the potential of a bacterium found in wastewaters to clean it. The team from the Central Salt and Marine Chemicals Research Institute in Gujarat found that Cronobacter sakazakii secretes a biosurfactant which successfully binds with oils and hydrocarbons in water to form emulsion, a colloid solution. Biosurfactants are active organic molecules produced by a wide variety of bacteria, yeast, algae and fungi. These compounds are low in toxicity, biodegradable and can easily form emulsion. Biosurfactants from yeast, algae and fungi are used in dairy, food, beverage, textile, paper pulp and pharmaceutical industries. But the potential of bacteria-derived biosurfactants has hardly been explored. To isolate the biosurfactant-producing bacteria, the researchers collected samples from soil, effluent, sludge and oil industry wastewaters from Jhagadia and Gondal, two industrial hubs in Gujarat. They isolated 43 types of colony-forming bacteria from the samples. Then they narrowed their search to six types of bacteria depending on their ability to destroy cells through biosurfactant production. Of the six types, Cronobacter sakazakii produced maximum biosurfactant. The team then analysed its ability to remove oil and hydrocarbons. For this the bacterium was cultured in a solution containing nutrients such as sucrose, peptone and yeast extract. The biosurfactant was then extracted and mixed with oils and hydrocarbons dissolved in water. They found the biosurfactant contained sugars and proteins which could bind and adsorb ions of oils and hydrocarbons through electrostatic interactions while forming emulsion. They also noted that the biosurfactant could dissolve readily in water having a broad pH range between 2 and 12. Unlike commercial emulsifiers the biosurfactant produced clear solution. The study will be published in the February 14 issue of Carbohydrate Polymers. With all these religions around, mankind has no faith in God. Therefore, it chooses to arrogantly ignore what nature (God) has provided us; even solutions to problems created by man. It prefers to 'invent' solutions, which more often than not creates another set of problems!! !